We can’t say we didn’t see this coming, but it’s sad news nonetheless. If you’re a fan of the little QWERTY bar business phone that popularized the form factor, then you’ll be sad to know that the company behind BlackBerries – Research in Motion, is having a tough time this year. A slow advancement in their core software and hardware technologies have led to a slowing down of sales for their business centered phones. The recently launched (but long-in-development) BlackBerry PlayBook QNX Tablet is also experiencing slow sales – probably due to the fact that it lacks several key features out of the box. Finally, in order to keep the numbers up, RiM has announced that they will be laying off some of their staff. So yeah, we told you it was sad didn’t we? Fiscal 2012 has gotten off to a challenging start. The slowdown we saw in the first quarter is continuing into Q2, and delays in new product introductions into the very late part of August is leading to a lower than expected outlook in the second quarter. RIM’s business is profitable and remains solid overall with growing market share in numerous markets around the world and a strong balance sheet with almost $3 billion in cash. We believe that with the new products scheduled for launch in the next few months and realigning our cost structure, RIM will see strong profit growth in the latter part of fiscal 2012. Hopefully what he says will turn out true, as competition from the Android and iOS spaces are quite poplar these days. If they don’t improve soon, Microsoft’s new Windows Phone 7 OS could even take some of their market share. They’re also announced to have shipped 13.2 million BlackBerries and 500,000 PlayBook tablets. Though these are shipped numbers, and not necessarily sold. 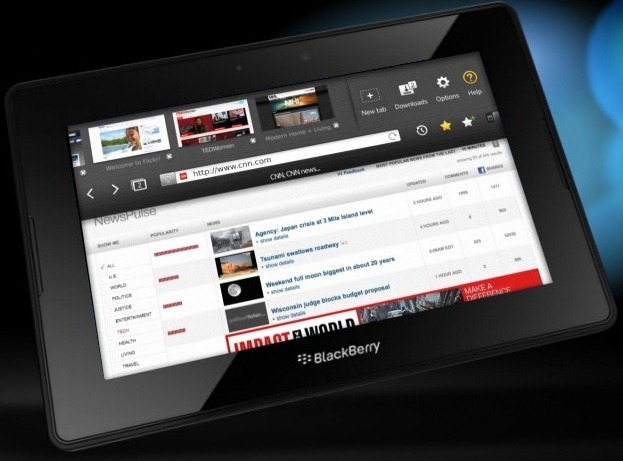 The BlackBerry PlayBook have been commended for its fast and intuitive interface, but have gotten mixed reviews because it lacks several key features – including e-mail and contacts right out of the box. Speaking of which, the PlayBook currently also lacks a decent selection of third party applications – a limitation that RiM wishes to address by later implementing an Android and Java runtime to increase app depth. Finally, to keep the numbers up, layoffs have been announced to allow for RiM to refocus on new products and strategic objectives along their highest growth opportunities. We do hope it works out for them – and we hope all affected workers can bounce back as soon as possible.